New time integration methods are proposed for simulating incompressible multiphase flow in pipelines described by the one-dimensional two-fluid model. The methodology is based on ‘halfexplicit’ Runge-Kutta methods, being explicit for the mass and momentum equations and implicit for the volume constraint. These half-explicit methods are constraint-consistent, i.e., they satisfy the hidden constraints of the two-fluid model, namely the volumetric flow (incompressibility) constraint and the Poisson equation for the pressure. A novel analysis shows that these hidden constraints are present in the continuous, semi-discrete, and fully discrete equations. Next to constraint-consistency, the new methods are conservative: the original mass and momentum equations are solved, and the proper shock conditions are satisfied; efficient: the implicit constraint is rewritten into a pressure Poisson equation, and the time step for the explicit part is restricted by a CFL condition based on the convective wave speeds; and accurate: achieving high order temporal accuracy for all solution components (masses, velocities, and pressure). Highorder accuracy is obtained by constructing a new third-order Runge-Kutta method that satisfies the additional order conditions arising from the presence of the constraint in combination with time-dependent boundary conditions. Two test cases (Kelvin-Helmholtz instabilities in a pipeline and liquid sloshing in a cylindrical tank) show that for time-independent boundary conditions the half-explicit formulation with a classic fourth-order Runge-Kutta method accurately integrates the two-fluid model equations in time while preserving all constraints. A third test case (ramp-up of gas production in a multiphase pipeline) shows that our new third-order method is preferred for cases featuring time-dependent boundary conditions. Sanderse, B, & Veldman, A.E.P. (2018). 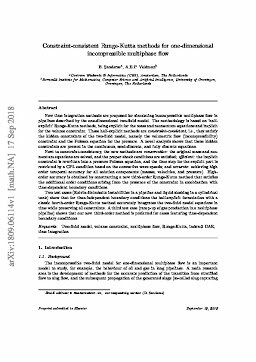 Constraint-consistent Runge-Kutta methods for one-dimensional incompressible multiphase flow. arXiv.org e-Print archive.